SALMON producers in the Northern Isles say they are confident 2019 could be the first year in the industry’s 40 year long history that no seals will be shot in Shetland as multi-million pound investments into anti-predator measures begin to show positive results. It also raised the serious question of reputational damage to Shetland as a wildlife tourism destination. Every year government agency Marine Scotland grants more than 40 licences to salmon farming companies allowing them to shoot seals to protect their stock and gear. The latest figures published by Marine Scotland show that between February 2017 and the end of January 2018 a total of 73 seals (54 grey and 19 common seals) were shot by salmon farmers in Scotland. 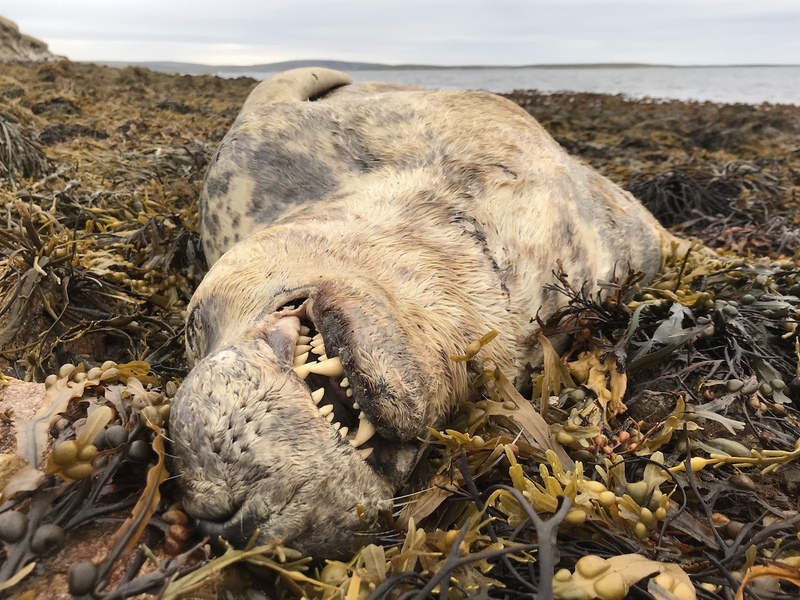 Scotland wide figures for 2018/19 are not available yet, but in Shetland 13 seals were killed during the latest reporting period, eight by Cooke Aquaculture, five by Scottish Sea Farms and none by Grieg Seafood. The multi-million pound industry is well aware that shooting seals is sending out the entirely wrong message to consumers increasingly conscious of how the food they buy is being produced. An US import ban on salmon from fish farms that kill marine mammals as of 2022 is also helping to focus minds. Cooke Aquaculture, the only salmon producer on the islands of Yell and Unst, readily admits that it had “probably” been them that had killed the seals in Basta Voe, and conceded that they should have done more to prevent the carcasses from coming ashore. Following an investigation by Marine Scotland the company was fined £2,000 for failing to report the killing of seals to the licencing authority within 48 hours. The government agency repeatedly refused to release this information saying only that its investigation had been completed “satisfactorily”. They also said that the presence of shot seals did “not in itself confirm illegal activity”. Cooke farm manager David Brown said the company was in the process of investing a total of £4.7 million into anti-predator nets designed and developed by the Indian company Garware-Wall Ropes. The Seal Pro netting is much tougher and has a more rigid surface than traditional nylon nets, and when supported by additional weights in the cages – a circular sinker tube – creates enough tension to prevent seals from being able to penetrate the nets. Brown said the company has had no issues with seals in the 140 cages so far fitted with the new netting, and expects the number of seals shot on their farms to drop to zero once all the company’s salmon farms are equipped with the new anti-predator netting by the end of 2019. 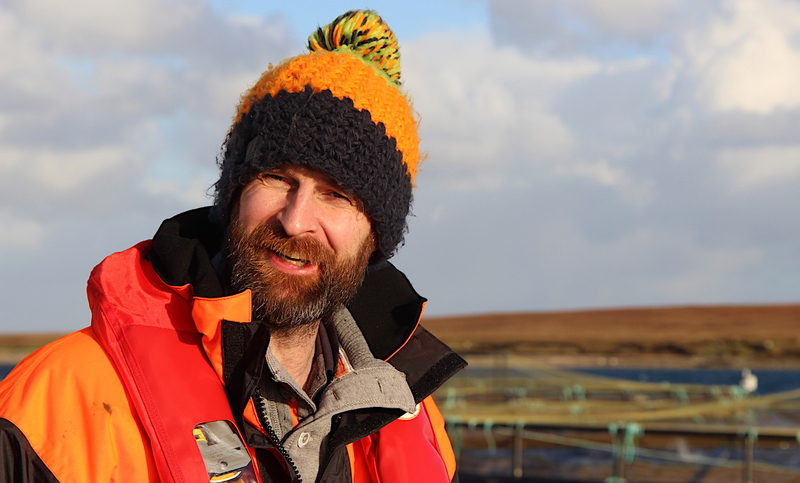 The other two large salmon farmers in Shetland, Grieg Seafood and Scottish Sea Farms, are both pursuing similar solutions and are equally confident that they either already have or will soon succeed in stopping the practice altogether. “We have sites with dedicated predator nets. These can be made of HDPE [high-density polyethylene] netting or of semi-rigid non-fibre plastic. We would then hang a traditional nylon net within the predator net to contain the salmon,” he said. “On other sites which are too tidal for predator nets we have a single net made of monofilament nylon which has a much higher breaking strain that the traditional nylon nets. They are also more rigid than traditional nets. 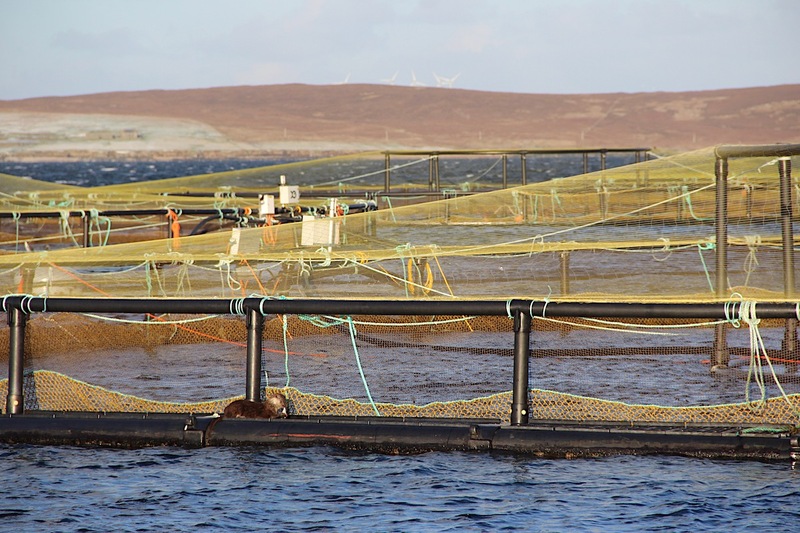 Scottish Sea Farms said they had so far installed Seal Pro netting at 21 of its 45 salmon farms in Scotland at a cost of £4.2 million, with nine further farms planned in 2019. Ralph Bickerdike, head of fish health at Scottish Sea Farms, said seal culling was the last resort option taken by farmers to protect the salmon. “Our priority has been to install Seal Pro nets at those farms with a historic seal challenge. The shift in the industry’s attitude was welcomed by Pete Bevington of Hillswick Wildlife Sanctuary. The sanctuary has a long history of looking after injured or abandoned marine mammals in Shetland, and have just been given the green light for a £500,000 refurbishment paid for mainly by the oil industry. Owners Pete and Jan Bevington have been campaigning to outlaw the shooting of seals for many years arguing that it was detrimental to both the local wildlife and the reputation of an important rural industry. Bevington said the issue had been left unaddressed for too long, and added: “We are glad that this is now taking place. What we really hope is that this sets some kind of precedent for the salmon industry elsewhere. “People are not happy hearing about wildlife being killed by industry no matter where and what industry that is. These times have to come to an end. “And it is no good trying to pretend it is not happening, because in this modern age, it will come out. People will hear about it and it will be very damaging for the industry as well as the wildlife that is being harmed. Wildlife Campaigner Lizzie Daly with one of the seal carcasses at Basta Voe, last August. 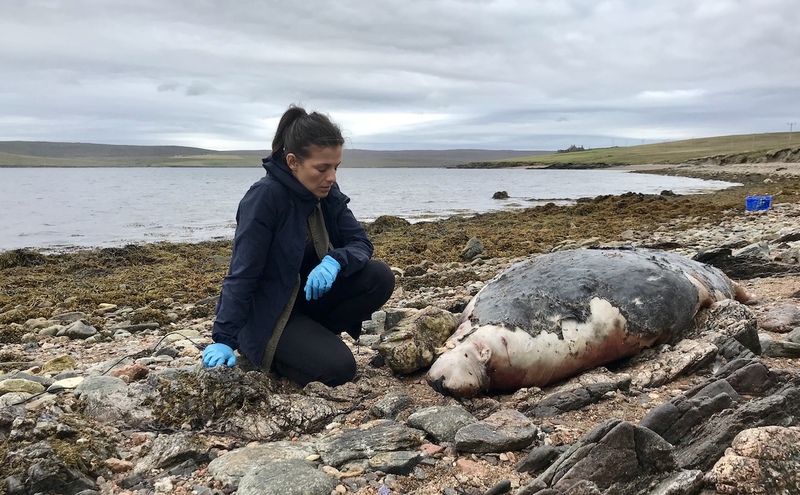 Wildlife presenter Lizzie Daly who travelled to Shetland in August to document the seal carcasses washed up at Basta Voe, (watch her video here) called for much tougher enforcement of the current licencing regime and added that, ultimately, the shooting of seals should be banned. 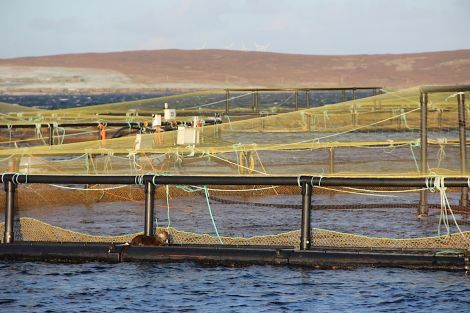 Salmon farms are an important industry for Scotland and the good news is that by investing in these nets it will show how it is possible for them to coexist alongside seals without the loss of fish or the shooting of seals,” she said. “For me, I would like to see a ban on the shooting of seals here in the UK. “Salmon farms are always going to be in the seal’s natural environment, so investing in effective long-term deterrents like double netting is a sensible solution for this. Meanwhile the Scottish Salmon Producers’ Organisation said it was “acutely aware of its responsibility for the welfare of its farmed fish and that of marine mammals which live alongside farms”. The industry body’s chief executiveJulie Hesketh-Laird said: “While the salmon farming sector is permitted under Scottish law to shoot seals, its ambition is to reduce the number to zero. “However, to achieve this salmon farmers will need help to ensure that the alternative deterrence techniques available solve the problem, against an increasing Scottish seal population”.